Doing this interview was harder than I first thought, primarily because I’ve worked very closely with Carlos Uribe during the past two years as co-curators of Inversiones (arte +intercambios + transacciones), a curatorial investigation that forms part of the Salón Regional de Artistas in Colombia, and secondly because although this online journal specializes in community projects in specific social contexts, it’s never easy to describe, much less analyze, a context for a public outside one’s own. This interview therefore seeks to present the social and urban context of Medellí­n’s Moravia district and show how activist artists are proposing different possibilities for community undertakings and socio-cultural development. Carlos Uribe is a well-regarded Colombian artist and is the former Director of the Moravia Center for Cultural Development. Adriana Rí­os: What is Moravia? 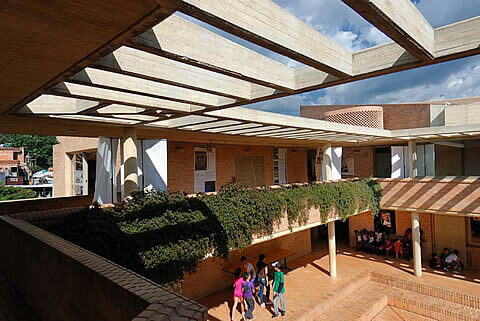 Carlos Uribe: Moravia is a young neighborhood in Medellí­n that has been in existence for 42 years. It sprung up in 1968 as an unplanned development and is, let’s say, a unique phenomenon. Moravia grew around a rubble deposit that later became a garbage depository and subsequently the city’s official garbage dump, due to errors within the government administration during the seventies. Between 1973 and 1983, the government authorized the dumping of any and all waste: residential, human, hospital and industrial. This created an infectious mish-mash, a mixture of different types of waste, including radioactive waste. Paradoxically, due to the social problems stemming from Colombia’s armed conflict, unplanned development processes led to Medellí­n becoming the focus of many displaced subsistence farmers, indigenous people, those of African descent and people from other parts of the country looking for a better life. They all concentrated around that garbage dump, living off recycled materials. In that epicenter of death rose an epicenter of life. Moravia is a community of 48,000 inhabitants living in a very small area, a neighborhood that has the highest population density in Colombia: a unique phenomenon. Apart from overcrowding, public services used as contraband, lack of schooling and intra-family violence, Moravia also has positive features, such as being a melting pot of cultures. The people who come from the north and south of the country, the Pacific or the Llanos give it a very wide-ranging cultural richness. Part of our responsibility is to make those memories, that identity, that culture, come to light. AR: Why was it decided that it was necessary to relocate the inhabitants of Moravia? CU: It was an area that didn’t receive much attention from the government, an area at the mercy of disputes between local elites and private developers. The garbage dump was legalized, and the fact that it is just some 15 or 20 blocks from the center of Medellí­n made it a unique circumstance, for a dump to be so close to a developing city. The population groups that established themselves there were affected by lawless groups, and the church and other organizations tried to support certain processes. Nevertheless, it was only eight years ago, when Sergio Fajardo was mayor, that a project to shape Moravia was started. A comprehensive macro project was undertaken to solve problems, focusing particularly within the former garbage dump, since people have been building their dwellings on it for some twenty years, placing public health at risk. Now attempts are being made to recover those land lots. Plots are beginning to be purchased in order to turn them into a park, not an amusement park but an environmental remediation and, I would say, a symbolic park. The communities that lived there understand that the space was not habitable and live in new places now, but they retain the memory of being pioneers of that settlement. Then a series of improvements were made through three works: one was the La Bermejala lineal park, which channels a ravine that crosses the neighborhood and caused a lot of flooding in rainy months; another involved improving pedestrian walkways, building bridges and a health-care center, completed in 2005, and the third was the Moravia Cultural Development Center, the most important facility in the area, which has managed to bond with the community by providing options in education and culture, such as fostering memory and identity processes.